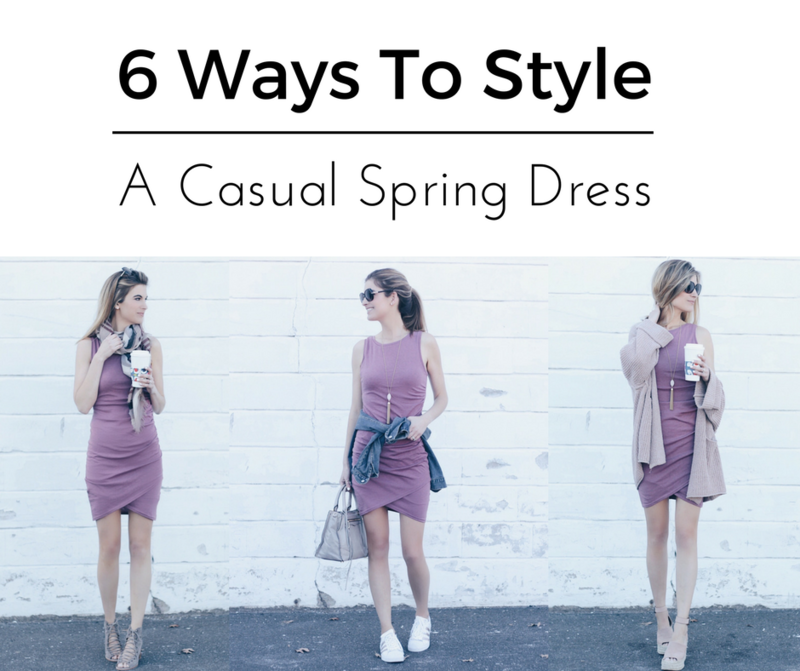 Today I’m teaming up with Nordstrom to show 6 different ways to style a casual Spring dress. I do not wear as many dresses since having kids but when I do I almost always get them from Nordstrom. They carry so many different styles and price points. I am always able to find something in my price range (usually under $100 unless it is for a special occasion). If you remember a few weeks ago on Instagram I shared the life changing moment when I found out Nordstrom now offers curbside pick-up. Is that even fair? I was laughing just thinking what my husband’s reaction would be. I can shop online during nap time and then drive to the store to pick up my clothes without even taking my boys out of their car seats. I am so lucky to live just FIVE MINUTES from a Nordstrom store (unplanned, I swear). With two kids (1 and 4 years old) trying things on in stores is rarely an option for me. The curbside pick-up has been a real game changer when I am in a pinch for something to wear for a particular occasion. I also utilize Nordstrom.com’s free shipping on an all too regular basis as well. So anyway…today I’m sharing a casual Spring dress that can be styled several way for lots of different occasions. It would be a great option to bring on a vacation because it packs so small in a suitcase and can be reworn to look like a different outfit. Did I mention the front of the dress is two layers (i.e. if you do bring it on a warm weather vacation it will absorb your sweat without showing through)? Not that you or I sweat (or poop, or pluck chin hairs). I am wearing this ruched dress in a size small which is my usual size. If you want more of a bodycon type fit (which is more flattering on a variety of body frames than most people think) I would recommend sizing down from your usual size. This dress comes in several color choices – including GRAY!! If you follow my Instagram you know I am a huge fan of gray! I can’t remember what came over me the day I decided to buy this rose color, but I ended up loving it. Did I mention this dress is machine washable and only $56? Dry clean only is usually a deal breaker for me. I paired this Spring dress with a simple scarf (my exact scarf is currently out of stock from Nordstrom) and my favorite Spring booties. This picture is really showing how badly I need my hair done :). I added a white blazer (similar, mine is several years old) and simple heeled sandal to this casual Spring dress to take it to more of business casual look. A white blazer is a great layering pieces for so many occasions in Spring and Summer. I wear mine often over dresses or over a cami paired with jeans and heels. Simply styled with a strappy heel and some bling. I you follow me on Instagram you know I wear this Free People cardigan all the time. I have it in pink and ivory. It’s been in and out of stock a lot lately because it went on major sale, so you can find a similar options here. My exact “blush” colored wedges are in limited sizes but this blush option is very similar and this pair is more affordable and has a fun lace up detail. My husband told me I paired a Mr. Rogers sweater with Pretty Woman boots for this look and suggested maybe it would be appropriate for a librarian. Aren’t husbands the sweetest 🙂 ? I was thinking something in the evening since this is a way to style a casual Spring dress for cooler temperatures. The statement necklace I am wearing is a two piece item that can be worn as just a choker or bib alone or paired together as I am wearing it above. By the way – I really wish I knew how to use Photoshop so I could get rid of that awkward nostril flare. I am so happy that sneakers have become stylish again. It makes my life as a mom much easier! This Adidas pair has been in and out of stock in the rose gold color I have but they also come in black, white, and silver stripes that would all pair well with this dress. I’d love to hear where you’re wearing dresses this time of year. My husband and I are at the age where we aren’t invited to as many weddings so I am attending a lot of baby showers and BBQ’s as the temps warm up. Love all the different ways you styled that versatile dress! Looking good mama! Wow you styled it so many different ways, and I love them all! But as a lazy mom my favorite must be the athleisure look and the oversized cardi with wedges! Great job Rach! Love the way you styled this so many different ways! Nailed it! Love them all. Thanks for sharing these great ideas and styles with one casual dress.